Campaigners against potential cuts to A&E services at Grantham Hospital and loss of maternity services at Boston’s Pilgrim Hospital have been holding a vigil outside a meeting of senior NHS leaders and other key stakeholders in Sleaford today (Wednesday). Members of campaign groups Fighting for Grantham Hospital and Save Our Services At Pilgrim Hospital were waiting outside the New Life Conference Centre in Sleaford as 150 managers from the health service as well as councillors from the county’s Health Scrutiny Committee and others arrived to consider and adjust a range of options and proposals to change health services in advance of a major public consultation in May. The purpose of the meeting today is to evaluate a number of proposals for hospital changes covering urgent and emergency care, maternity services, children’s specialist services (paediatrics), learning disability services, planned care services and stroke services. The meeting follows on from the work of the Lincolnshire Health and Care Programme to come up with a new model for delivering health and care in the county, called a Sustainability and Transformation Plan, which they hope will be both safe and sustainable in the long term. Key concerns among campaigners are fears that the Grantham A&E will be downgraded to an urgent care centre and maternity services will be centralised at Lincoln, creating fears that it is only a financial exercise which will pile more pressure on remaining A&E services and put patients at risk wby having to travel further to be treated. 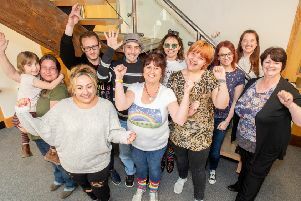 Melissa Darcy of the F4GH group told The Standard this morning: “We have come here to show our presence and let them know we are not backing down and a reminder of who they are making decisions for and we will expand into Sleaford to spread the word. We are being kept away from the options. Phillip Bosworth of SOS Pilgrim Hospital group said: “We have thousands of followers now, now the STP leaders claim to have got the ideas of 15,000-18,000 people but they won’t say who they are and none of these people would have been asked about the options because the STP had not even been released. The challenges facing the health and care system in Lincolnshire have been described in detail in the recently published STP. According to LHAC, this five year plan makes clear that some clinical services will need to change in the future in response to growing demand from an ageing population. It says many of these services struggle to meet safety standards due to the shortage of key staff and proposals have been developed over the last 2-3 years including plans to centralise some services and move some other services much closer to home. All health organisations in Lincolnshire are committed to holding a public consultation in 2017 to get the views of residents on proposals for changes to these services. It is insisted no final decisions will be made until after the public consultation. Attendees are being asked to consider the detailed evidence for each proposal and look at the impact of the proposal against four criteria – quality, access, affordability and deliverability, while offering their own input from issues raised so far. Representatives from local health and care groups within the independent and voluntary sectors are also at the meeting, but campaigners are unhappy that they, as interested members of the public, have been excluded. Speaking ahead of the event, Allan Kitt, Chief Officer of South West Lincolnshire Clinical Commissioning Group explained: “We have to follow the appropriate process to ensure the proposals we put to the public are fit for purpose. NHS England are clear that proposals can only be put to the public if they are clinically safe and deliverable. Today’s meeting will allow us to gather together those senior clinicians and experts who have helped to develop our proposals, along with key local stakeholders, to look at what is being proposed and take a view on the impact of those proposals. Following today’s meeting, proposals for public consultation will still need to be reviewed by an independent regional panel of experts and approved by NHS England before the consultation can be launched in May. * Lincolnshire Health and Care was started in 2013 (under the name Lincolnshire Sustainable Services Review) when health and care organisations in Lincolnshire realised that current services did not adequately meet the needs of residents, due to growing demands and financial pressures. * LHAC Partners include, Lincolnshire West Clinical Commissioning Group, South Lincolnshire Clinical Commissioning Group, South West Lincolnshire Clinical Commissioning Group, Lincolnshire East Clinical Commissioning Group, United Lincolnshire Hospitals NHS Trust, Lincolnshire Partnership NHS Foundation Trust, Lincolnshire Community Health Services NHS Trust, Lincolnshire County Council, Lincolnshire Local Medical Committee, Healthwatch Lincolnshire (observer seat on behalf of Lincolnshire residents), Lincolnshire Care Association, East Midlands Ambulance Services NHS Trust and NHS England. * The STP is the result of 12 months of work by health and care organisations, building on a further two years of conversation through the Lincolnshire Health and Care Programme about the future of services in Lincolnshire. This has cost the health service £4.7million to produce.